The vessel supports multi-purpose operations revolving around ROV and AUV deployments, offshore instrument deployments, and diving tasks. When switching between these activities, mobilization and reconfiguration of the vessel in port is required. Most vessel configurations can be completed in one day. Mobilization days can be requested during the annual proposal process. Departure and arrival times – An average science day is 0700 to 1630. Please arrive at the dock by 0630. Science party size – On standard day trips, the maximum number of science participants is 10. This includes ROV pilots and/or AUV technicians. The number of crew and pilots or AUV technicians will vary depending on the mission. Generally there will be five ship’s crew. Two ROV pilots will be onboard for ROV dives and/or two AUV technicians for AUV missions. For CTD missions a CTD technician will be required. An extended day is generally 0600 to 1730. Science personnel should be onboard by 0530. Must be requested and approved in advance via the project proposal process. These extended days need to be assigned to specific dates in the calendar year. Departure and arrival times for extended days are typically set by safety, weather, personnel, and transit time considerations. A standard extended cruise without daylight restrictions will be scheduled for departure at 0600 and returning by 1730. Personnel are expected onboard no later than 0530. Standard winter season extended cruises with daylight restrictions will be scheduled for departure at 0630, returning by 1800. Personnel are expected onboard no later than 0600. The Captain, AUV Group Leader or Chief ROV Pilot may use their discretion to modify these standard guidelines to match weather, tidal or daylight patterns. Extended offshore operations may be requested when the scientific mission requires this type of capability, however, this type of activity is limited by available vessel crew. Advanced planning is required for scheduling the transition period from day to night work for the AUV team and vessel crew. 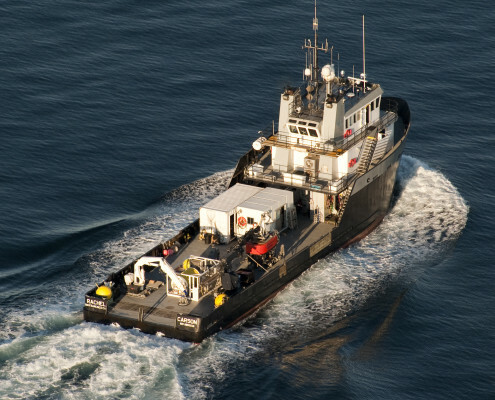 Also, 24-hour operations require advanced planning in order to comply with USCG regulations. Please coordinate these special scheduling requests with Chris Grech during the project proposal and planning process. Extended operations need to be assigned to specific dates in the calendar year. Departure and arrival times for night operations are typically determined by safety, scientific, weather, personnel, and transit time considerations. The total number of science personnel and crew must equal 12. Usually six crew members will be required, leaving six available bunks for ROV pilots, AUV technicians and scientists/engineers. Non-MBARI participants must sign the visiting participant release form and submit to captain. The standard operational day is scheduled for weekdays only. Operations that require weekend periods should be requested during the project proposal process in the sea time request form. Due to the limited facilities onboard the R/V Rachel Carson, our standard duration is limited to 9 continuous offshore days when planning extended cruises. Food is available in the galley, however no cook is provided. Sanitary system — Please note when requesting extended cruises that there are only two shower facilities and three heads. Checklists for ROV users and supplies to bring onboard during cruises. MBARI strives to ensure the comfort and safety of staff and visitors by encouraging a fragrance free environment in the ROV control room. The wet lab also includes a small refrigerator (24″x24″), freezer (24″x24″) and space for compressed air tanks.